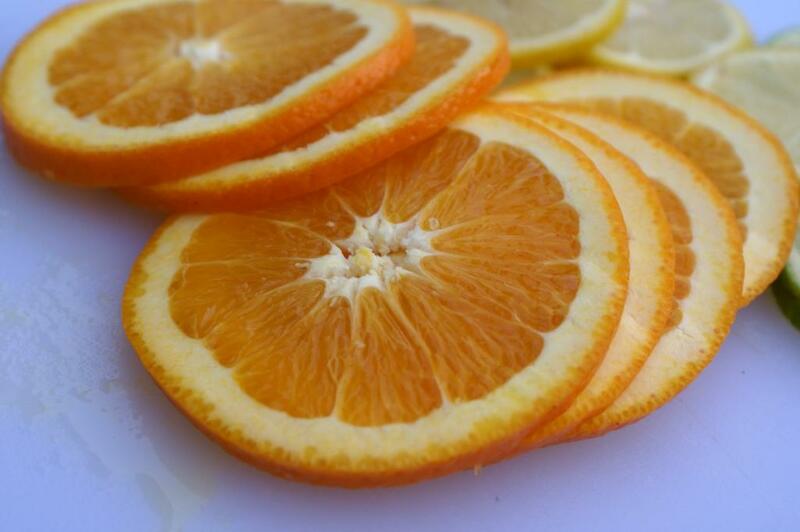 Isn’t this time of the year perfect for making some citrussy treats?! This past weekend I was totally obsessed with thoughts of making a dessert with the citrus fruits that were waiting in my fridge for their turn to be used. I went through pages and pages of familiar recipes but nothing was really calling my name. In a mixer bowl beat the butter, sugar and salt until light and fluffy. Add the whole egg and the yolk and mix to combine. Add the flour and mixed until it has been absorbed. Divide the dough in half, flatten each half into a disk, wrap in plastic and leave to rest in the fridge for about 2 hours. On a floured surface roll out the half of the dough and press into a 9 –inch fluted tart pan with a removable bottom. Chill 15-20 minutes. Preheat the oven to 365 F. Put the tart pan on a cookie sheet and place it all together into the lower part of the oven. Bake until edges just start to darken (about 15 minutes). Remove from the oven and cool completely. To make the filling in a medium bowl whisk together eggs, sugar, melted butter, crème fraiche, citrus zest, lemon/orange juice, salt and almond extract. Let stand for 5 minutes. 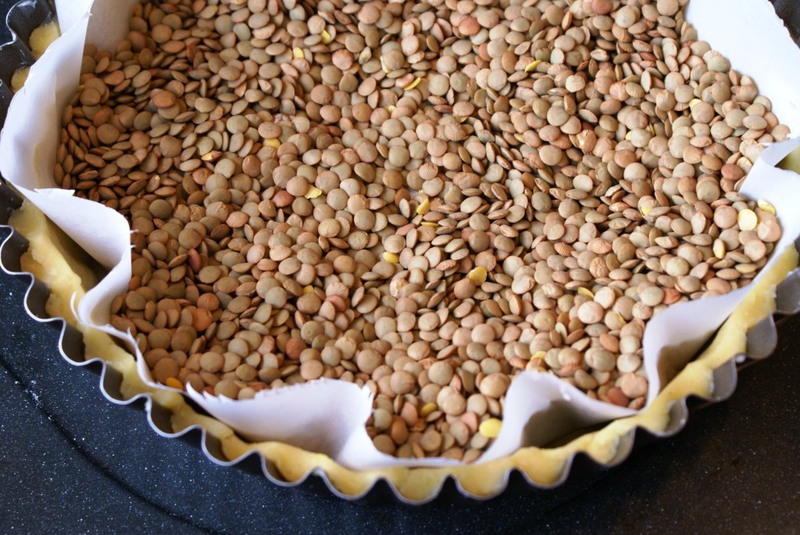 Place the tart shell on to a baking sheet. Place the baking sheet into the oven. 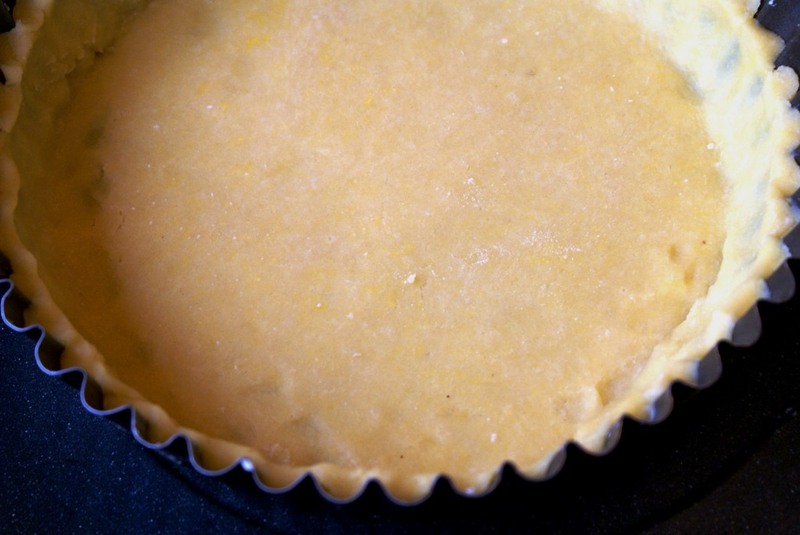 Carefully pour the filling mixture into the tart shell. Bake until filling is completely set and no longer jiggles in the center (about 30 minutes). The filling will remain bright yellow. Transfer baked tart to a wire rack and let cool. Chill completely in the refrigerator. 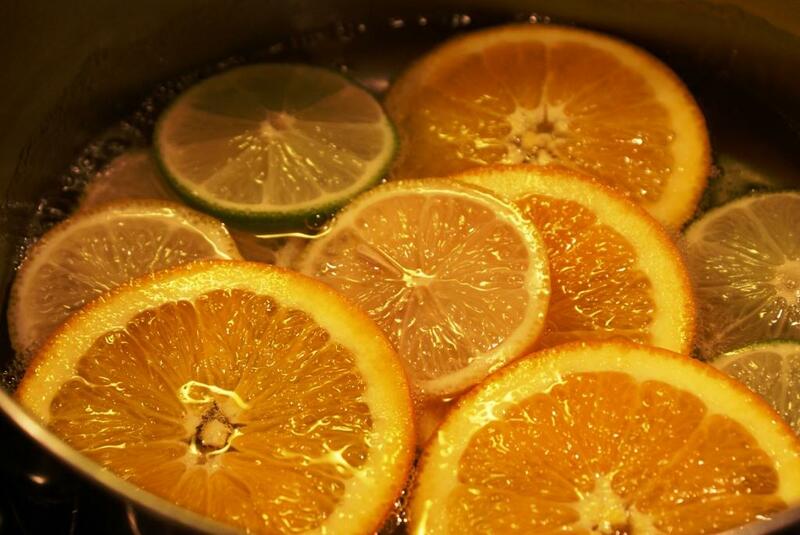 To make the candied citrus slices place the sugar and water in a medium sauce pan and bring it to boil. Reduce to a simmer. Add the lemon and orange slices and poach at very low simmer until the rinds are translucent (about 40 minutes). Let cool completely in the syrup. Drain the slices and pat dry with paper towels. 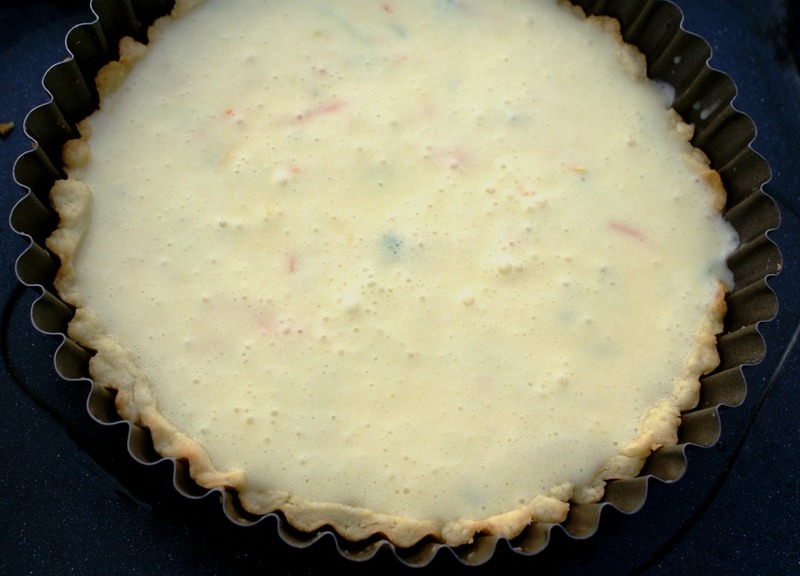 Set the cooled tart on a top a large can and allow sides of the pan to fall. Place the tart on a serving plate. 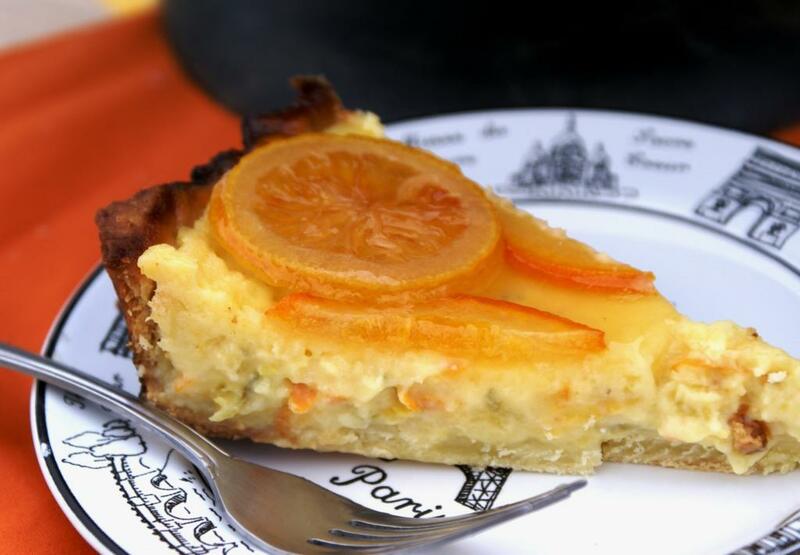 Arrange candied lemon and orange slices on the top of the tart. In a small saucepan, stir together jam, lemon juice and water. Bring to boil. Set a fine strainer over a small bowl. Strain the glaze into the bowl. With a pastry brush, brush the glaze over the candied fruit slices and crust. Sibella, the top looks so beautiful with the different citrus slices, and I’ll bet the mix is delicious. Thanks Darryl! The tart was wonderful, I had a hard time not eating two pieces at a time! 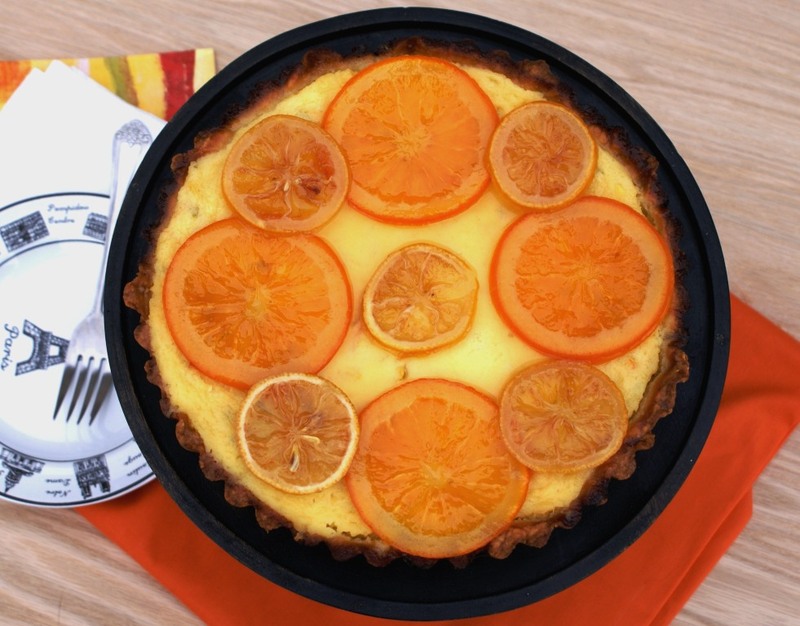 Yum, what a great adaptation from lemon tart! I bet it was wonderful. Thanks Bam, I love the citrussy flavor of it – definitely my kind of dessert! 🙂 For my new heading I downloaded some new fonts from 1001freefonts.com and worked in power point. I grouped all pieces of the project and save them as a jpg. photo and then I uploaded it as a blog header. 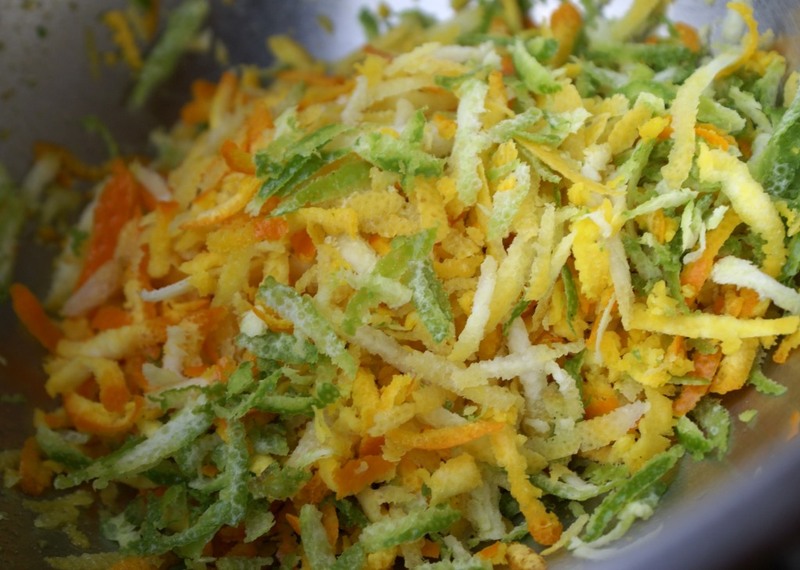 I’m so intrigued by the photo of the grated citrus peels. Love how you adapted this recipe to suit your style, Sibella. Hi Sibella, I’m visiting via Bam’s Kitchen. 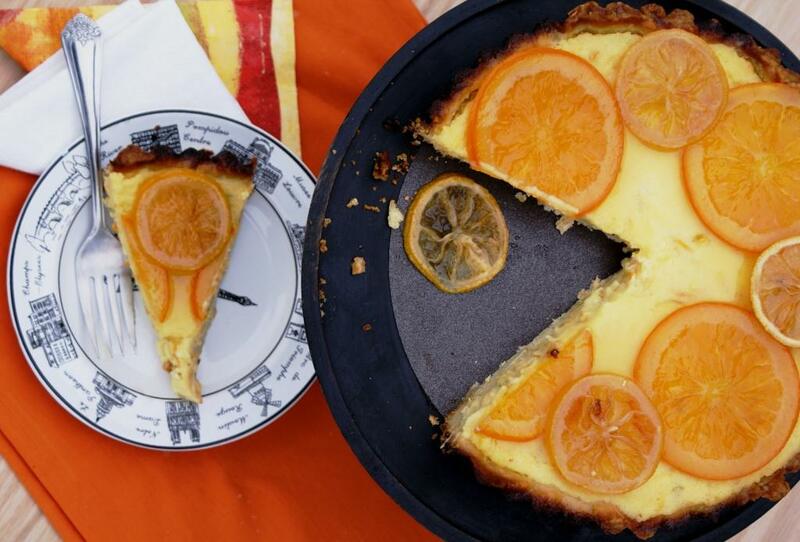 Love, love, love your citrus tart. How lucky to find the book (and recipe) while waiting for your daughter to check out her books. I bet it was just amazing! Hello Allison, so glad to have you over for a visit! 🙂 Oh the tart was SO GOOD and I am sure I will be making it again! I’m bookmarking your post so I can make it as well. Anything lemony is always at the top of my list!